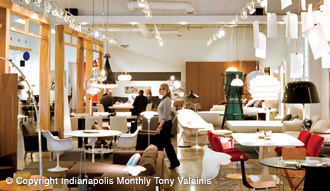 Form + Function is your center for contemporary design in furniture, lighting and accessories based in Indianapolis. Having opened in 1996 as a small accessory boutique, we have grown to represent a who’s who in the world of modern and contemporary design ideas, from Bauhaus and Mid Century Classics to the latest creations by today’s masters. We specialize in furniture and lighting, yet we also offer a broad selection of additional objects, from the teaspoon and bath tub to floor covering and original art. May this site help you navigate our fascinating universe, may it inspire you, and most of all may it entice you to drop in for a visit.